You might be asking what's this smoothie craze all about? They're everywhere! According to Wikipedia smoothies have been around since the 1930's coming along with the invention of the kitchen blender making it possible to reduce whole fruits and vegetables in to liquid. By the late 1960s, smoothies made from ice, milk, fruit and fruit juices were widely sold across the US mostly by health food stores which was fueled by the health food movement you know the "hippies". In the 1970's Smoothie King was founded setting the stage for numerous smoothie bars across the United States adding ingredients such as vitamins and protein powder into the smoothies. As smoothies became more popular and prominent when large companies decided to make bottled smoothies and sell them in supermarkets. As you can see smoothies aren't so much of a craze as it's a part of our eating culture. Even though the word "smoothie" brings up images of healthiness that's not always the case. It's definately buyer beware. If you are not make your smoothie yourself in your kitchen you really don't know what is being put in this yummy drink. What determines the healthiness is the ingredients, sugars, amount and kind of chemical additives and manufacturing process. Remember Smoothie King? According to Eat This Not That the worst smoothie is the Hulk Strawberry topping off at 964 calories, half the recommended calories for a whole day. As with all foods it pays to be an informed consumer in this case the search for healthy smoothies. To me smoothies are the ultimate fast food. They're easy to make, takes seconds to make, virtually no mess, and the perfect on the go food. Smoothies fantastic benefits will help you tremendously on your journey to better health. 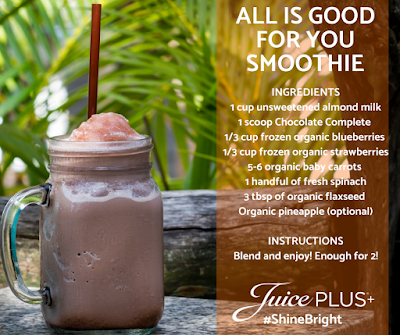 You can have fun matching and mixing various smoothie ingredients. Smoothies help you take control of your health through delicious and simple healthy alternative; choosing from various recipes will help you choose the one that would be more pleasant to drink consistently. Kids love them too. Most importantly smoothies help meet the USDA daily allowance of fruits, veggies, nuts, seeds, plant protein & healthy fats. This is important because when we eat fresh produce it improves our body's ability prevent heart disease, cancer, diabetes, Alzheimer's and all chronic diseases. If you are wondering just how good smoothies are for you.